Asus has launched the FonePad, a 7-inch tablet with the ability to make calls and the successor to PadFone called the Padfone Infinity at MWC 2013. 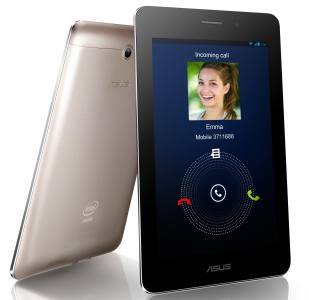 Asus has introduced a 7-inch tablet at MWC 2013 with the ability to make calls. The device boasts of 3G HSPA connectivity. Christened the FonePad, the tablet has a 7-inch display with a 1280x800 pixel resolution. It runs on Android 4.1 Jelly Bean and is powered by an Intel Atom Z2420 single-core 1.2GHz processor, 1GB RAM and PowerVR SGX540 graphics. The device also has expandable storage up to 32GB via a microSD card and built-in storage of 16GB. The FonePad is made out of metal, is light at 340 grams and is slim at 10.4mm thin. The tablet compromises on a rear-facing camera and has a 1.2MP front facing camera. The tablet houses an earpiece just like smartphones giving users the ability to hold it to their ears to make calls. The FonePad is expected to hit store shelves between April and June and will be priced at $249. 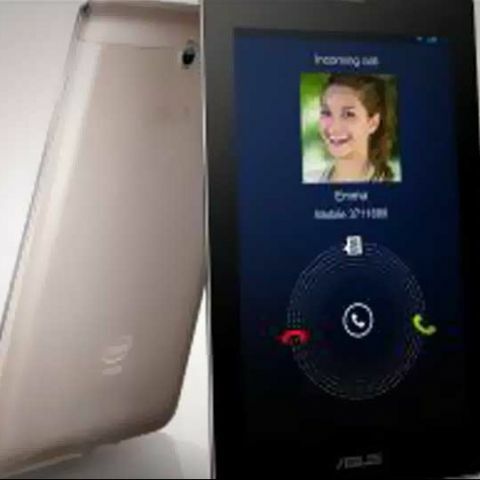 The Asus Padfone Infinity on the other hand is a 5-inch 1080p HD smartphone with specifications to rival other flagship android smartphones. The 5-inch display has a pixel density of of 441ppi. 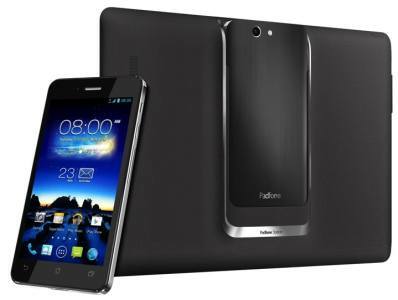 Under the hood, the Padfone Infinity uses a Qualcomm Snapdragon 600 chipset 1.7GHz quad-core Krait 300 CPU. The rear of the smartphone has a 13MP camera with the ability to shoot video in 1080p. The PadFone also houses a massive 2400mAh battery, which the company claims is good for 19 hours of 3G calls, 6.5 hours of web browsing, 9 hours of watching video or 410 hours of standby. It also supports LTE, NFC along with 64GB built-in storage and 50GB cloud storage available to the user. Once the PadFone is docked into the docking station, it can be used as a tablet. The 10.1-inch tablet docking station has a 1920x1200 pixel resolution and a 5000mAh battery. The tablet docking station boasts of 18mm drivers in its loudspeaker. 3rd generation Sonic Master audio enhancing tech is also present in the tablet docking station of the PadFone Infinity. There are a bunch of preset audio modes available to users which includes game mode, movie mode, voice mode and more. The PadFone along with its tablet docking station will be available to users in April for $1,325. The first-generation PadFone saw the light of day in India and we had some hands on time with the device. You can check out our in-depth review of the first generation PadFone here.